In January, the Weekly published an investigation into the Chicago Housing Authority (CHA)’s failure to redevelop public housing in Bronzeville after demolishing much of it in the early 2000s. The demolition of projects such as Ida B. Wells, Robert Taylor, and Stateway Gardens was part of the now-notorious Plan for Transformation, a federally funded initiative that promised to replace the demolished high-rises with new housing developments that would combine subsidized and market-rate housing units. The Plan also promised that the CHA would rebuild or rehabilitate a total of 25,000 units overall. The Weekly’s investigation found that the CHA is nearly a decade behind its proposed redevelopment timelines and that many of the high-rise sites have remained vacant, awaiting construction that has yet to be planned or announced. The CHA said in a statement to the Weekly in January that its “commitment to the communities along the State Street corridor remains the same today as it did in 2000,” and that redevelopment on the vacant parcels was in the works. In a variety of statements over the years, the agency has blamed the 2008 financial crisis and recession for the slowdown in reconstruction. Since the Weekly’s investigation was published, the CHA has released two documents that offer further information about its near-future redevelopment plans. One of these is its 2016 annual report to the U.S. Department of Housing and Urban Development (HUD), where it gives a summary of the progress it has made on the Plan for Transformation the preceding year. These reports include a section detailing how many units of housing the CHA has built, rehabilitated, or acquired toward its 25,000-unit goal. In the 2016 report, this section shows that out of the 740 units of public housing the agency added to its stock in 2016, only 115 were mixed-income housing redevelopment. The other 600-odd were delivered primarily through rehabilitation of existing CHA housing (218 units at Altgeld Gardens were rehabilitated) or through other housing subsidy programs. Sixty of these 115 mixed-income units were at Rosenwald Courts, a redevelopment project that involved the total renovation of a historic Bronzeville apartment complex; the restoration, which cost more than $130 million, was financed through a combination of public and private loans and grants. Fifteen more units were delivered at Casa Querétaro in Pilsen, an affordable housing development built in collaboration with The Resurrection Project. But though the CHA will count these new affordable housing projects in Pilsen and Bronzeville toward its Plan for Transformation goals, these projects do not represent the actual redevelopment of the high-rise sites that were demolished as part of the Plan. On that front, the agency only delivered forty units in 2016. These were fifteen units at Parkside (the redevelopment of Cabrini-Green) and twenty-five at “City Gardens” (a part of the Rockwell Gardens redevelopment project) on the West Side. The CHA delivered no new units at the redevelopments for Stateway Gardens, Ida B. Wells, Robert Taylor, or Harold Ickes. More broadly, though, the CHA’s strategy for fulfilling the goals of the Plan for Transformation has shifted dramatically away from the construction of new housing and the rehabilitation of existing housing. 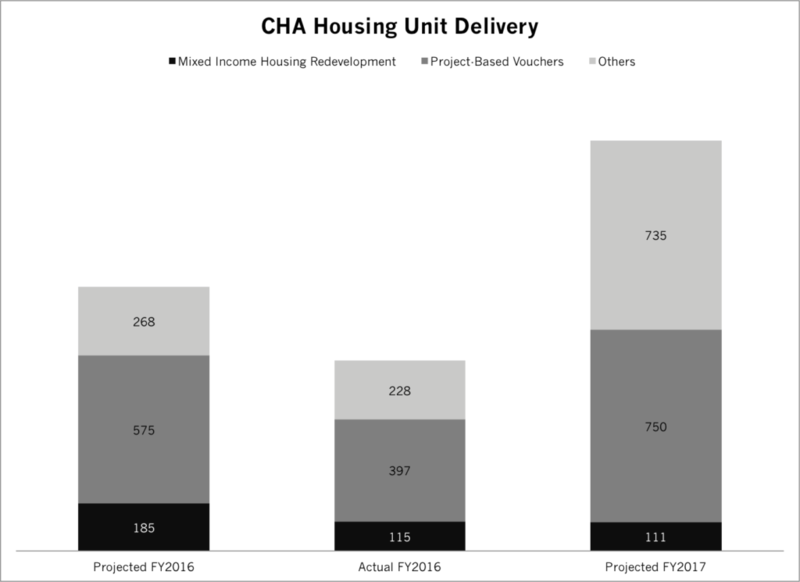 Most of the units the CHA has added to its housing stock over the past five years have been delivered through the “project-based voucher” program, wherein the CHA offers subsidies to property owners to provide housing to people from the agency’s waitlist. These project-based vouchers, which did not count toward fulfilling the Plan for Transformation until the CHA amended its agreement with HUD in 2010, accounted for more than half of the units the agency delivered last year. In addition to its retrospective annual reports, the CHA also releases a forward-looking annual plan at the beginning of each year detailing its scheduled redevelopment activities for that year. It follows up on these plans in its annual reports to HUD and evaluates whether it met its own benchmarks (it has not done so in at least five years). Its 2017 plan also does not project any construction on the State Street Corridor sites: of the 111 units the agency plans to build in 2017, sixty-six are at Sterling Park Apartments in Homan Square, which will turn a former Sears & Roebuck corporate headquarters into affordable housing, and nineteen are at St. Edmund’s Oasis, a new affordable housing development in Washington Park. Both developments were originally scheduled for completion in 2016. By the end of 2017, then, two years will have passed since there was new redevelopment construction on the State Street Corridor (in 2015 the CHA completed another phase of the Stateway Gardens redevelopment and a number of small off-site buildings near the Robert Taylor Homes). Curbed Chicago reported in February that construction work on the Harold Ickes redevelopment in the South Loop, which will contain around 200 units of public housing, was intended to start in the third quarter of this year, which means new public housing units could be delivered there as early as 2018. The CHA could not be reached for further comment before this story went to print. This story will be updated when a response is received. Does CHA have any plans for the development of the sites located at 22nd & State Street or Taylor Street & Racine Avenue? These are prime locations that are close to downtown and the jobs that lower income people need. I understand that the current residents of these neighborhoods want nothing to do with CHA but their fears should not enter into the decisions that CHA should make.